Buttermaking – learn about butter and how you can make it at home. Kefir – forget about making yogurt. Kefir is so much easier and more versatile. Grilling lean beef – learn how to best grill lean beef the Argentina way. Sausage recipes – making delicious sausages. Buying Beef For The Freezer– info on purchasing beef in bulk. How much will my freezer hold? Figure about 20lbs per cubic foot of freezer space. 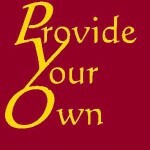 Visit ProvideYourOwn.com for informative articles on Food, Energy, Health, Technology and more. Break free from global corporate control. See Terms for more information. All content posted on this site is commentary or opinion and is protected under Free Speech. WillowHills is not responsible for content written by contributing authors. The information on this site is provided for educational and entertainment purposes only. It is not intended as a substitute for professional advice of any kind. WillowHills assumes no responsibility for the use or misuse of this material. Your use of this website indicates your agreement to these terms and those published here. All trademarks, registered trademarks and servicemarks mentioned on this site are the property of their respective owners. The content of WillowHills is licensed under the Creative Commons Attribution-ShareAlike 3.0 Unported License.